It’s not currently clear if the person currently underneath a red line train at Metro Center jumped or fell in front of the train, but the response has been the same: DC Fire & EMS is currently working with WMATA and WMATA Police to extract them from underneath the undercarriage of the train. The Red Line is closed between Dupont Circle and Judiciary Square while they work on the tech rescue. 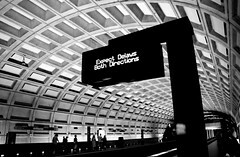 Trains are turning around at Dupont and Judiciary Square, according to tweets. DC Fire & EMS are currently evaluating one adult male, priority 1 (highest priority), who is under the train, and is also evaluating a bystander who assisted. We’ll have updates as they come. Update: 9:05pm Metro is now saying that the person put themselves on the track intentionally in the incident. I was in the station when this happened. Is there any word on the person? Is he/she alive? It was terrible!